Can a Chiropractor help with Foot and Ankle Pain? The feet are your foundation of your body and movement. Which means when you experience pain around your foot or ankle, mobility is greatly reduced. Your posture can also be affected resulting in spinal and body function issues. Chiropractic care offers skilled extremity techniques that can treat foot problems. Your whole body posture is considered and it is vital that the foundation of your body, your feet, are correct and balanced. As it affects complete body balance, mobility and function. We take standing digital foot scans with our 3D laser foot scanner that will identify any biomechanical faults and imbalances within the feet. 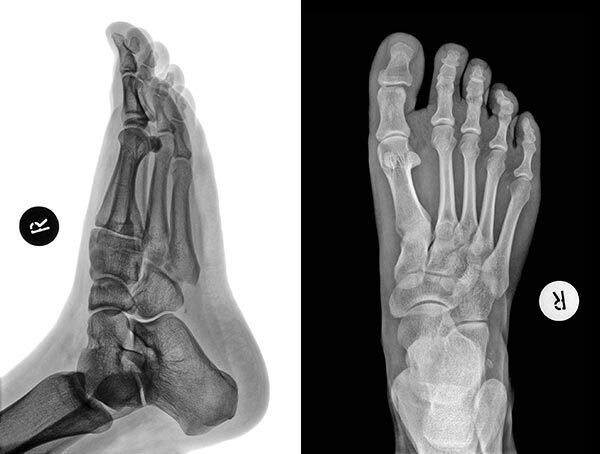 We will show and explain the result of this foot scan and how it affects the entire body above. Custom flexible orthotics are specifically made to your feet from the scan. Based on your specific needs and lifestyle, each pair is precisely measured, assessed and crafted to properly support all 3 arches in your foot. The ankle is a diarthrodial joint made of the tibia, fibula and talus, whilst the foot comprises of 26 bones, making 33 joints including the ankle joint. Can Chiropractic help with foot and ankle pain? Chiropractic adjustments can be performed on many different joints, including the foot and ankle. And whilst people tend to think of Chiropractors only working on the spine, at Innate Chiropractic we also are highly trained in adjusting the extremities – feet, knees, hips, wrists, elbows and shoulders. In fact, anywhere two or more bones connect is a joint, that can have the potential to be out of alignment and lacking normal mobility, and need a chiropractic adjustment if indicated. We find the ankle responds well to ankle adjustments because the ankle joint tends to become stiff with our lifestyle choices, where its primary need is to be mobile. Your treatment can be done by hand or with low force instruments for acute and painful presentations, offering immediate relief. If your ligaments are stretched and torn, due to an ankle sprain or in other cases an accidental event, then we would treat in a different manner. It is very common for patients to tell us they have had ankle pain for a long time and just learnt to live with it. It can be dull ache after activity or a jammed and blocked type of feel. At times it can feel sharp too. You don’t have to cope with reoccurring ankle pain. Innate Chiropractic can treat you, relieve you of your symptoms and provide recommendations to improve your foot and ankle joint mobility and function. The foot is made up of a lot of little joints which can move out of alignment when you start walking on it. This is because the body now has to deal with gravity, as well as the feet dealing with body weight. Furthermore nerve irritation because of compression in your lower back can lead to referred foot pain. Chronic foot pain is a debilitating condition and can severely affect your daily activities. Our expert Chiropractors can help you with specialised and individual treatment. Very few shoe companies in the world design and make shoes which follow the natural foot shape, are wide, flexible and lightweight. Here at Innate Chiropractic we are very proud to have two of these brands available to our patients. They are Topo Athletic and Vivobarefoot shoes.